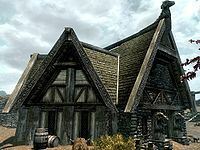 House Gray-Mane is the home of Clan Gray-Mane in Whiterun. It is located in the Wind District, opposite the Gildergreen tree. It is the first house on the left, at the top of the stairs leading up from the marketplace. It has a fenced area beside the house, where their cow lives. Once you have completed the reputation quest for Whiterun, in the corner is one of three barrels in the city marked with the Cache shadowmark. The house has two entrances at the front and rear of the property. At the front there is a Loot shadowmark at the bottom of the left-hand wooden carving that flanks the front door. Completing the related quest gains you the friendship of the clan, especially Fralia Gray-Mane, who will continue to thank you every time you speak to her for the rest of the game. It allows you to take all low value items and use all the beds from within the home freely. The house contains many items of fancy crockery and many sacks of food throughout. Entering through the front door leads directly into a central room with a large fire pit in front of you. To the right of this is a cooking pot on a stand, with a low table and two chairs behind the fire. On the table is a honey nut treat, a bottle of Nord mead and a common book. On your right, in the eastern corner is a set of shelves holding crockery and flanked by two chairs. To the left is a small wardrobe containing fine clothes and a crate with two wall shelves above. In front of these is a flight of wooden stairs leading up to the partially boarded upper floor. In the northern corner is a set of shelves holding four common books, a cheese wheel, a bowl containing ten garlic bulbs, and a gourd. To the left of this is a doorway to a storage area either side of the rear door. Further to the left along the northwest wall is a tall wardrobe containing fine clothes. At the southwestern end of the room is a large wooden table with three chairs situated on each side of it. On the table are two bottles of wine, two portions of grilled leeks, a loaf of bread, a gourd, a goat cheese wedge, two baked potatoes, two salmon steaks, a sweet roll, and a bowl containing green apples. Against the southwest wall is a narrow table holding a bowl of green apples and a platter filled with a haunch of raw venison, a potato, a tomato and a bulb of garlic. To the left of the large table is a set of shelves holding three bottles of wine and beside this is a food barrel and a crate with a sweet roll on top. The storage area, either side of the rear door has two wall shelves to the left, over a pile of firewood and a cupboard, an unlocked chest and a fish barrel to the right. On the cupboard shelves are a couple of pieces of cheese, while the chest contains only minor loot. 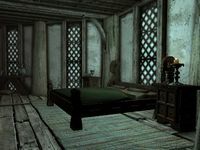 In the middle of the northeast wall is a pair of wooden doors leading into Fralia Gray-Mane's bedroom. It contains a large double bed coming out from the northeast wall with end tables on either side. Against the north wall is a narrow table holding a bottle of alto wine and a bowl containing three honey nut treats, while against the northwest wall is a dresser containing clothes with an unlocked chest and a piece of cheese on top. In the southern corner is a round wooden table and two chairs, set for two, holding a bottle of alto wine, two more honey nut treats and a long taffy treat. At the top of the stairs you will see that the upper floor has been boarded in a horse shoe balcony overlooking downstairs with two doors off of it; one immediately on your left and the other opposite at the northeastern end of the house. The first room is a bedroom containing a single bed, behind the door in the eastern corner of the room, with an end table beside it and a wedge of cheese on top. Against the southeast wall is a dresser with a bottle of ale and a silver sapphire necklace on top, a wash basin to the left and a chair to the right. Against the northwest wall is a small cupboard with a set of fine clothes on top and a pair of fine boots beside it. To the northeast on the other side of the door is a large cupboard holding a bowl of red apples and a small table to the left with a jug on top. On the balcony, to the right of the bedroom is a tall wardrobe and further along the southwest wall is a small cupboard with a bottle of wine on top. In the western corner is a chair with three bookcases to the right, along the northwest wall. There are twenty common books and a bottle of wine on the shelves. 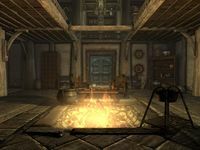 In the northern corner is a low table with a bottle of wine on top and a chair beside it and two unlocked chests against the northeast wall separated by a small partition. To the right of the second of these is a set of shelves holding two bottles of Nord mead. At the end of the balcony is a large wooden table and two chairs, with a bottle of ale and a bowl containing three potatoes. Between the shelves and table is the second door leading to another bedroom, this containing a large four-posted double bed with an end table on either side and an unlocked chest at the foot of the bed. On the end table on the left is a bottle of Nord mead and a silver emerald necklace. Either side of the door is a tall wardrobe and wash basin to the left and a dresser with a set of clothes on top and a pair of boots beside. Although he is absent, Thorald Gray-Mane is also a member of Clan Gray-Mane. Ordinarily he would live in the house with the rest of his family. This page was last modified on 16 March 2017, at 02:53.